Clares of Croydon Ltd is a family company and one of the oldest companies in Croydon. The company was founded by Ernest (Ernie) Clare. Ernie started his career, with an engineer friend, by buying and selling engineering tools and machinery. After the First World War the pair took on a shop in Church Street, Croydon which was soon crammed with second hand tools and machines. Ernie delighted in any craft skill and became very competent in several trades including plumbing, gas and steam fitting and engineering. Ironically it was his younger sister, Cissy, who showed the greatest interest in key cutting. 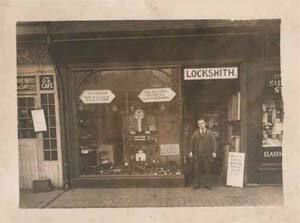 In time the accent of the business changed more towards gereral ironmongery and lock and key work. During World War Two Ernie built a reputation for his work on safes and was frequently asked by the police to open and repair safes in bombed-out buildings. Ernie's son Tony joined his father and in 1957 E A Clare and Son was set up. During his time as a locksmith, Tony was instrumental in setting up the Master Locksmiths Association, which is still the main governing body for standards in the locksmith industry. In 1984 Tony's son, Mark, joined the company introducing access control and intruder alarm systems. The company later became Clare's of Croydon Ltd. The premises are now at 54 Tamworth Road, close to where the original company was formed.